For other uses, see Canoe (disambiguation). In British English, the term "canoe" can also refer to a kayak, while canoes are then called Canadian canoes to distinguish them from kayaks. Canoes are widely used for competition and pleasure, such as racing, whitewater, touring and camping, freestyle, and general recreation. Canoeing has been part of the Olympics since 1936. The intended use of the canoe dictates its hull shape and length and construction material. Historically, canoes were dugouts or made of bark on a wood frame, but construction materials evolved to canvas on a wood frame, then to aluminum. Most modern canoes are made of molded plastic or composites such as fiberglass. Canoes were developed by cultures all over the world, including some designed for use with sails or outriggers. Until the mid-1800s the canoe was an important means of transport for exploration and trade, and in some places it still is used as such, perhaps with the addition of an outboard motor. Where the canoe played a key role in history, such as the northern United States, Canada, and New Zealand, it remains an important theme in popular culture. 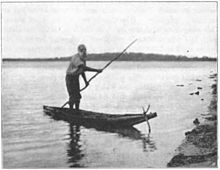 The word canoe comes from the Carib kenu (dugout), via the Spanish canoa. Constructed between 8200 and 7600 BC, and found in the Netherlands, the Pesse canoe may be the oldest known canoe. Excavations in Denmark reveal the use of dugouts and paddles during the Ertebølle period, (ca 5300 BC – 3950 BC). Australian Aboriginal people made canoes using a variety of materials, including bark and hollowed out tree trunks. The indigenous people of the Amazon commonly used Hymenaea trees. The Pacific Northwest canoes are a dugouts usually made of red cedar. Many indigenous peoples of the Americas built bark canoes. They were usually skinned with birch bark over a light wooden frame, but other types could be used if birch was scarce. At a typical length of 4.3 m (14 ft) and weight of 23 kg (50 lb), the canoes were light enough to be portaged, yet could carry a lot of cargo, even in shallow water. Although susceptible to damage from rocks, they are easily repaired. 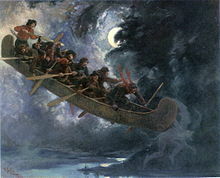 Their performance qualities were soon recognized by early European immigrants, and canoes played a key role in the exploration of North America, with Samuel de Champlain canoeing as far as the Georgian Bay in 1615. René de Bréhant de Galinée a French missionary who explored the Great Lakes in 1669 declared: "The convenience of these canoes is great in these waters, full of cataracts or waterfalls, and rapids through which it is impossible to take any boat. When you reach them you load canoe and baggage upon your shoulders and go overland until the navigation is good; and then you put your canoe back into the water, and embark again. American painter, author and traveler George Catlin wrote that the bark canoe was "the most beautiful and light model of all the water crafts that ever were invented." 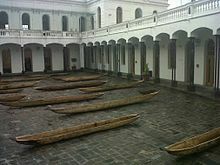 These antique dug out canoes are in the courtyard of the Old Military Hospital in the Historic Center of Quito. Native American groups of the north Pacific coast made dugout canoes in a number of styles for different purposes, from western red-cedar (Thuja plicata) or yellow-cedar (Chamaecyparis nootkatensis), depending on availability. Different styles were required for ocean-going vessels versus river boats, and for whale-hunting versus seal-hunting versus salmon-fishing. The Quinault of Washington State built shovel-nose canoes, with double bows, for river travel that could slide over a logjam without portaging. The Kootenai of British Columbia province made sturgeon-nosed canoes from pine bark, designed to be stable in windy conditions on Kootenay Lake. The first explorer to cross the North American continent, Alexander Mackenzie, used canoes extensively, as did David Thompson and the Lewis and Clark Expedition. The rabaska or canot du maître was designed for the long haul from the St. Lawrence River to western Lake Superior. Its dimensions were: length approximately 11 m (35 ft), beam 1.2 to 1.8 m (4 to 6 ft), and height about 76 cm (30 in). It could carry 60 packs weighing 41 kg (90 lb), and 910 kg (2,000 lb) of provisions. With a crew of eight or ten (paddling or rowing), they could make three knots over calm waters. Four to six men could portage it, bottom up. Henry Schoolcraft declared it "altogether one of the most eligible modes of conveyance that can be employed upon the lakes." Archibald McDonald of the Hudson's Bay Company wrote: "I never heard of such a canoe being wrecked, or upset, or swamped ... they swam like ducks." The canot du nord (French: "canoe of the north"), a craft specially made and adapted for speedy travel, was the workhorse of the fur trade transportation system. About one-half the size of the Montreal canoe, it could carry about 35 packs weighing 41 kg (90 lb) and was manned by four to eight men. It could be carried by two men and was portaged in the upright position. The express canoe or canot léger, was about 4.6 m (15 ft) long and were used to carry people, reports, and news. The birch bark canoe was used in a 6,500-kilometre (4,000 mi) supply route from Montreal to the Pacific Ocean and the Mackenzie River, and continued to be used up to the end of the 19th century. Also popular for hauling freight on inland waterways in 19th Century North America were the York boat and the batteau. In 19th-century North America, the birch-on-frame construction technique evolved into the wood-and-canvas canoes made by fastening an external waterproofed canvas shell to planks and ribs by boat builders Old Town Canoe, E.M. White Canoe, Peterborough Canoe Company and at the Chestnut Canoe Company in New Brunswick. Although canoes were once primarily a means of transport, with industrialization they became popular as recreational or sporting watercraft. John MacGregor popularized canoeing through his books, and in 1866 founded the Royal Canoe Club in London and in 1880 the American Canoe Association. The Canadian Canoe Association was founded in 1900, and the British Canoe Union in 1936. Sprint canoe was a demonstration sport at the 1924 Paris Olympics and became an Olympic discipline at the 1936 Berlin Olympics. The International Canoe Federation was formed in 1946 and is the umbrella organization of all national canoe organizations worldwide. In recent years First Nations in British Columbia, Washington State have been revitalizing the ocean-going canoe tradition. Beginning in the 1980s, the Heiltsuk and Haida were early leaders in this movement. The paddle to Expo 86 in Vancouver by the Heiltsuk, and the 1989 Paddle to Seattle were early instances of this. In 1993 a large number of canoes paddled from up and down the coast to Bella Bella in its first canoe festival - 'Qatuwas. The revitalization continued - an Tribal Journeys began with trips to various communities held most years. Hull design must meet different, often conflicting, requirements for speed, carrying capacity, maneuverability, and stability The canoe's hull speed can be calculated using the principles of ship resistance and propulsion. Length: this is often stated by manufacturers as the overall length of the boat, but what counts in performance terms is the length of the waterline, and more specifically its value relative to the displacement of the canoe. Displacement is the amount of water displaced by the boat. It is equal to the total weight of the boat and its contents, since a floating body displaces its own weight in water. When a canoe is paddled through water, it takes an effort to push all of the displaced water out of the way. Canoes are displacement hulls: the longer the waterline relative to its displacement, the faster it can be paddled. Among general touring canoeists, 5.2 m (17 ft) is a popular length, providing a good compromise between capacity and cruising speed. Too large a canoe will simply mean extra work paddling at your cruising speed. Width (beam): a wider boat provides more stability at the expense of speed. A canoe cuts through the water like a wedge, and a shorter boat needs a narrower beam to reduce the angle of the wedge cutting through the water. Freeboard: a higher-sided boat stays drier in rough water. The cost of high sides is extra weight, extra wind resistance and increased susceptibility to cross-winds. Keel: an external keel makes a canoe track (hold its course) better, and can stiffen a floppy bottom, but it can get stuck on rocks and decrease stability in rapids. Profile, the shape of the canoe's sides. Sides which flare out above the waterline deflect water but require the paddler to reach out over the side of the canoe. If the gunwale width is less than the waterline width (or the maximum width) the canoe is said to have tumblehome. This increases final hull stability. Rocker: viewed from the side of the canoe, rocker is the amount of curve in the hull, much like the curve of a banana. A straight keeled canoe, with no rocker, is meant for covering long distances in a straight line. The full length of the hull is in the water, so it tracks well and has good speed. As the rocker increases, so does the ease of turning, at the cost of tracking. Native American birch bark canoes were often characterized by extreme rocker. Hull symmetry: viewed from above, a symmetrical hull has its widest point at the center of the hull and both ends are identical. An asymmetrical hull typically has the widest section aft of center line, creating a longer bow and improving speed. Plastic: Royalex is a composite material, comprising an outer layer of vinyl and hard acrylonitrile butadiene styrene plastic (ABS) and an inner layer of ABS foam, bonded by heat treatment. As a canoe material, Royalex is lighter, more resistant to UV damage, is more rigid, and has greater structural memory than non-composite plastics such as polyethylene. Royalex canoes are, however, more expensive than aluminium canoes or canoes made from traditionally molded or roto-molded polyethylene hulls. It is heavier, and less suited for high-performance paddling than fiber-reinforced composites, such as fiberglass, kevlar, or graphite. Rotational molding Roto-molded polyethylene is a cheaper alternative to Royalex. Production of Royalex ceased in 2014. Fiber reinforced composites: Fiberglass is the most common material used in manufacturing canoes. Fiberglass is not expensive, can be molded to any shape, and is easy to repair. Kevlar is popular with paddlers looking for a light boat that will not be taken in whitewater. Fiberglass and Kevlar are strong but lack rigidity. Boats are built by draping the cloth on a mold, then impregnating it with a liquid resin. A gel coat on the outside gives a smoother appearance. Polycarbonate: Lexan is used in transparent canoes. Aluminum: Before the invention of fiberglass, this was the standard choice for whitewater canoeing. It is good value and very strong by weight. This material was once more popular but is being replaced by modern lighter materials. "It is tough, durable, and will take being dragged over the bottom very well", as it has no gel or polymer outer coating which would make it subject to abrasion. The hull does not degrade from long term exposure to sunlight, and "extremes of hot and cold do not affect the material". It can dent, is difficult to repair, is noisy, can get stuck on underwater objects, and requires buoyancy chambers to assist in keeping the canoe afloat in a capsize. Folding canoes usually consist of a PVC skin around an aluminum frame. Inflatable: These contain no rigid frame members and can be deflated, folded and stored in a bag. The more durable types consist of an abrasion-resistant nylon or rubber outer shell, with separate PVC air chambers for the two side tubes and the floor. These materials and techniques are used by artisans and produce boats that some consider more attractive, but which are more fragile than those made with modern methods. Bark: the indigenous peoples of eastern Canada and the northeast United States made canoes using the bark of the paper birch, which was harvested in early spring by stripping off the bark in one piece, using wooden wedges. Next, the two ends (stem and stern) were sewn together and made watertight with the pitch of balsam fir. The ribs of the canoe, called verons in Canadian French, were made of white cedar, and the hull, ribs, and thwarts were fastened using watap, a binding usually made from the roots of various species of conifers, such as the white spruce, black spruce, or cedar, and caulked with pitch. Dugout: Many indigenous groups from around the world made dugout canoes, by carving out a single piece of wood; either a whole trunk, or a slab of trunk from particularly large trees. Reed: Some peoples, with less access to suitable trees, made canoes from bundled reeds. Papyrus was used in Egypt, Totora in South America, and Tule in California. Canvas on wood frame: while similar to bark canoes in the use of ribs, and a waterproof covering, the construction method is different, being built by bending ribs over a solid mold. Once removed from the mold, the decks, thwarts and seats are installed, and canvas is stretched tightly over the hull. The canvas is then treated with a combination of varnishes and paints to render it more durable and watertight. Wood strips: these are built by securing narrow, flexible strips of wood, usually cedar, edge-to-edge over a building jig that defines the shape of the hull. Once the strips are glued together, a transparent fiberglass and epoxy coating is applied to the canoe inside and out. Clinker, lapstrake, or carvel: a wooden construction using longitudinal planks to form the hull. Traditionally planking is nailed together with copper tacks. Once the planking is completed, steam-bent ribs are inserted into the hull and fastened with nails or rivets. Stitch and glue: plywood panels are stitched together to form a hull shape, and the seams are reinforced with fiberglass tape and thickened epoxy. In Canada, the canoe has been a theme in history and folklore, and is a symbol of Canadian identity. From 1935 to 1986 the Canadian silver dollar depicted a voyageur and an Indigenous person paddling a canoe with the Northern Lights in the background. The Chasse-galerie is a French-Canadian tale of voyageurs who, after a night of heavy drinking on New Year's Eve at a remote timber camp want to visit their sweethearts some 100 leagues (about 400 km) away. Since they have to be back in time for work the next morning they make a pact with the devil. Their canoe will fly through the air, on condition that they not mention God's name or touch the cross of any church steeple as they fly by in the canoe. One version of this fable ends with the coup de grâce when, still high in the sky, the voyageurs complete the hazardous journey but the canoe overturns, so the devil can honour the pact to deliver the voyageurs and still claim their souls. In John Steinbeck's novella The Pearl set in Mexico, the main character's canoe is a means of making a living that has been passed down for generations and represents a link to cultural tradition. The Māori, indigenous Polynesian people arrived in New Zealand in several waves of canoe voyage. Canoe traditions are important to the identity of Māori. Whakapapa (genealogical links) back to the crew of founding canoes served to establish the origins of tribes, and defined tribal boundaries and relationships. Modern canoe types are usually categorized by the intended use. Many modern canoe designs are hybrids (a combination of two or more designs, meant for multiple uses). The purpose of the canoe will also often determine the materials used. Most canoes are designed for either one person (solo) or two people (tandem), but some are designed for more than two people. Sprint canoe is also known as flatwater racing. The paddler kneels on one knee, and uses a single-blade paddle. Canoes have no rudder, so the boat must be steered by the athlete's paddle using a j-stroke. Canoes may be entirely open or be partly covered. The minimum length of the opening on a C1 is 280 cm (110 in). Boats are long and streamlined with a narrow beam, which makes them very unstable. A C4 can be up to 9 m (30 ft) long and weigh 30 kg (66 lb). ICF classes include C1 (solo), C2 (crew of two), and C4 (crew of four). Race distances at the 2012 Olympic Games were 200 and 1000 meters. In ICF whitewater slalom paddlers negotiate their way down a 300 m (980 ft) of whitewater rapids, through a series of up to 25 gates (pairs of hanging poles.) The colour of the poles indicates the direction in which the paddlers must pass through; time penalties are assessed for striking poles or missing gates. Categories are C1 (solo) and C2 (tandem), the latter for two men, and C2M (mixed) for one woman and one man. C1 boats must have a minimum weight and width of 10 kg (22 lb) and 0.65 m (2 ft 2 in) and be not more than 3.5 m (11 ft) long. C2s must have a minimum weight and width of 15 kg (33 lb) and 0.75 m (2 ft 6 in), and be not more that 4.1 m (13 ft). Rudders are prohibited. Canoes are decked and propelled by single-bladed paddles, and the competitor must kneel. In ICF wildwater canoeing athletes paddle a course of class III to IV whitewater (using the international scale of river difficulty), passing over waves, holes and rocks of a natural riverbed in events lasting either 20–30 minutes ("Classic" races) or 2–3 minutes ("Sprint" races). Categories are C1 and C2, for both women and men. C1s must have a minimum weight and width of 12 kg (26 lb) and 0.7 m (2 ft 4 in), and a maximum length of 4.3 m (14 ft). C2s must have a minimum weight and width of 18 kg (40 lb) and 0.8 metres (2 ft 7 in), and a maximum length of 5 metres (16 ft). Rudders are prohibited. The canoes are decked boats which must be propelled by single bladed paddles and inside which the paddler kneels. Marathons are long-distance races which may include portages. Under ICF rules minimum canoe weight is 10 and 14 kg (22 and 31 lb) for C1 and C2 respectively. Other rules can vary by race, for example in the Classique Internationale de Canots de la Mauricie athletes race in C2s, with a maximum length of 5.6 m (18 ft 6 in), minimum width of 69 cm (27 in) at 8 cm (3 in) from the bottom of the centre of the craft, minimum height of 38 cm (15 in) at the bow and 25 cm (10 in) at the centre and stern. The Texas Water Safari, at 422 km (262 mi), includes an open class, the only rule being the vessel must be human-powered, and although novel setups have been tried, the fastest so far has been the six-man canoe. A square-stern canoe is an asymmetrical canoe with a squared-off stern for the mounting of an outboard motor, and is meant for lake travel or fishing. (In practice, use of a side bracket on a double-ended canoe often is more comfortable for the operator, with little or no loss of performance.) Since mounting a rudder on the square stern is very easy, such canoes often are adapted for sailing. 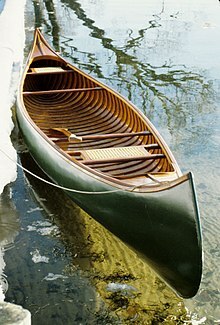 In North America, a "touring canoe" or "tripping" canoe is a good-tracking boat, good for wind-blown lakes and large rivers with larger capacity for wilderness travel. Touring canoes are often made of lighter materials and built for comfort and cargo space. Tripping canoes such as the Chestnut Prospector derivates, and the Old Town Trippers, are typically made of heavier and tougher materials, and are usually a more traditional design. A Prospector canoe is a generic name for copies of the Chestnut model, a popular type of tripping canoe marked by a symmetrical hull and a relatively large amount of rocker, giving a nice balance for wilderness tripping. This model also has the ability to carry large amounts of gear while being maneuverable enough for rapids. This makes it a superb large capacity wilderness boat, but requires skill on windy, broad waters when lightly loaded. It is made in a variety of materials. For home construction, 4 mm (3⁄16 in) plywood is commonly used, mainly marine ply, using the "stitch and glue" technique. Commercially built canoes are commonly built of fibreglass, HDPE, Kevlar, Carbon Fiber, and Royalex which although relatively heavy, is very durable. A touring canoe is sometimes covered with a greatly extended deck, forming a "cockpit" for the paddlers. A cockpit has the advantage that the gunwales can be made lower and narrower so the paddler can reach the water more easily. A canoe specialized for whitewater play and tricks. Most are identical to short, flat-bottomed kayak playboats except for internal outfitting. The paddler kneels and uses a single-blade canoe paddle. Playboating is a discipline of whitewater canoeing where the paddler performs various technical moves in one place (a playspot), as opposed to downriver where the objective is to travel the length of a section of river (although whitewater canoeists will often stop and play en-route). Specialized canoes known as playboats can be used. ^ "Canoe". Merriam-Webster Dictionary. Retrieved 20 October 2012. ^ "Buying a canoe or kayak". gocanoeing.org. Retrieved 8 September 2014. ^ "Dugout Canoe". The Canadian Encyclopedia. Retrieved 30 January 2013. ^ "The history of the canoe". canoe.ca. Retrieved 27 September 2012. ^ "Dugouts and paddles". Retrieved 8 October 2012. ^ "Carved wooden canoe, National Museum of Australia". Nma.gov.au. Retrieved 2013-04-25. ^ "Bark canoes". Canadian Museum of Civilization. Retrieved 8 October 2012. ^ "Our Canoeing Heritage". The Canadian Canoe Museum. Retrieved 8 October 2012. ^ Kellogg, Louise Phelps (1917). Early Narratives of the Northwest. 1634–1699. New York. pp. 172–173. ^ Catlin, George (1989). Letters and Notes on the Manners. Customs, and Conditions of the North American Indians (reprint ed.). New York. p. 415. ^ a b Pojar and MacKinnon (1994). Plants of the Pacific Northwest Coast. Vancouver, British Columbia: Lone Pine Publishing. ISBN 1-55105-040-4. ^ Nisbet, Jack (1994). Sources of the River. Seattle, Washington: Sasquatch Books. ISBN 1-57061-522-5. ^ "The Canoe". The Hudson's Bay Company. Retrieved 6 October 2012. ^ a b "Portage Trails in Minnesota, 1630s-1870s". United States Department of the Interior National Park Service. Retrieved 20 November 2012. ^ "Canoeing". The Canadian Encyclopedia. Retrieved 8 October 2012. ^ "A Venerable Chestnut". Canada Science and Technology Museum. Retrieved 8 October 2012. ^ "Canoe / kayak sprint equipment and history". olympic.org. Retrieved 29 September 2012. ^ Canoeing : outdoor adventures. Champaign, IL: Human Kinetics. 2008. ISBN 0-7360-6715-9. ^ a b c d e f g h Davidson, James & John Rugge (1985). The Complete Wilderness Paddler. Vintage. pp. 38–39. ISBN 0-394-71153-X. ^ a b "How to Choose a Canoe: A Primer on Modern Canoe Design". GORP. Archived from the original on 2012-10-18. Retrieved 7 October 2012. ^ "Canoe Design". Retrieved 8 October 2012. ^ a b "The Hull Truth". Mad River Canoe. Retrieved 7 October 2012. ^ a b "Royalex (RX)". Archived from the original on 2011-02-25. Retrieved 20 November 2010. ^ "Canoe Materials". Frontenac Outfittesr. Retrieved 7 October 2012. ^ "Buying The Right Canoe". Retrieved 6 October 2012. ^ "Buying The Right Canoe - Materials". Retrieved 6 October 2012. ^ Margry, Pierre (1876–1886). Decouvertes et etablissements des francais dans I'ouest et dans le sud de I'Amerique Septentrionale (1614–1754). 6 vols. Paris. ^ Tom Vennum, Charles Weber, Earl Nyholm (Director) (1999). Earl's Canoe: A Traditional Ojibwe Craft. Smithsonian Center for Folklife Programs and Cultural Studies. Archived from the original on 2013-01-04. Retrieved 2012-12-03. ^ Olympic Peninsula Intertribal Cultural Advisory Committee (2002). Native Peoples of the Olympic Peninsula. Norman, Oklahoma: University of Oklahoma Press. ISBN 0-8061-3552-2. ^ "The Wood and Canvas Canoe". Wooden Canoe Heritage Association. Retrieved 26 October 2012. ^ "The Canoe". McGill University. Retrieved 16 October 2012. ^ "The Pearl: Themes, Motifs, & Symbols". Spark Notes. Retrieved 16 October 2012. ^ "Story: Canoe traditions". The Encyclopedia of New Zealand. Retrieved 16 October 2012. ^ "Canoe sprint". International Canoe Federation. Archived from the original on 2010-10-08. Retrieved 22 November 2012. ^ "Canoe Sprint Overview". International Canoe Federation. Retrieved 22 November 2012. ^ "About Canoe Slalom". International Canoe Federation. Retrieved 22 November 2012. ^ "Rules for Canoe Slalom" (PDF). International Canoe Federation. Archived from the original (PDF) on 2012-03-20. Retrieved 22 November 2012. ^ "Wildwater Competition rules 2011" (PDF). International Canoe Federation. Retrieved 22 November 2012. ^ "La Classique Internationale de Canots de la Mauricie: Rules and Regulations". Archived from the original on 2013-01-19. Retrieved 30 November 2012. ^ "Texas Water Safari: History". Retrieved 30 November 2012. Wikisource has the text of the 1911 Encyclopædia Britannica article Canoe. This page was last edited on 25 March 2019, at 21:54 (UTC).